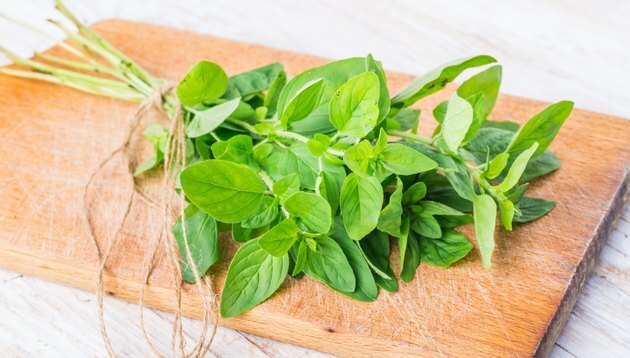 Oregano is commonly known for its culinary use — stirred into pasta sauce, sprinkled on pizza or roasted potatoes or in a salad dressing — but it also has a long history of medicinal use. The leaves of the oregano plant contain various chemical compounds, and research findings suggest they may have antibacterial, antifungal and chemopreventive properties. When consumed in excess, these same compounds can have serious side effects, even resulting in death. The oil extracted from the leaves of the oregano plant are rich in a plant chemical called phenols. Phenolic compounds are essential in the human diet, and they have been widely studied for their antioxidant capacity and their ability to fight diseases such as cancer and heart disease. Carvacrol may fight the growth of bacteria, including antibiotic-resistant bacteria, as noted in a study published in 2015 in Frontiers in Microbiology. Thymol has antifungal effects, useful for treating oral thrush, or candidiasis, as reported in a 2015 study in BMC Complementary and Alternative Medicine. Rosmarinic acid helps modulate tumor necrosis factor, an immune system substance that plays a role in cancer treatment and prevention, according to a 2010 study in Cancer Letters. In addition to its antibacterial, antifungal and anticancer effects, oregano oil may help lower cholesterol, relieve pain, aid weight loss and fight parasitic infections. Unlike the dried or fresh herb used in cooking, oregano oil for medicinal use is highly concentrated. It can be very easy to take too much without even realizing it. However, thymol in oregano oil can have toxic effects when used in large doses over a long period of time. Oregano — leaf and oil — may also increase the risk of bleeding, so people with bleeding disorders should avoid it. Additionally, people who are having surgery should not use oregano for two weeks before their procedure. Oregano may also lower blood sugar, so diabetics should be careful when consuming the leaf, but especially the oil. Finally, pregnant women are advised not to take oregano medicinally in any dose because it may increase the risk of miscarriage. As a supplement, oregano oil is typically sold in liquid and capsule form. It isn't regulated by the FDA, and no recommended dosage has been established. There are many different oil of oregano supplements on the market: extracts and standardized oils with varying amounts of active compounds. Oregano oil may be 100 percent pure or mixed with other oils. Stick to the recommended dosage and check in with your doctor to make sure oregano oil won't interact with any medications you're currently taking. Read more: What Are the Benefits of P73 Oregano Oil?